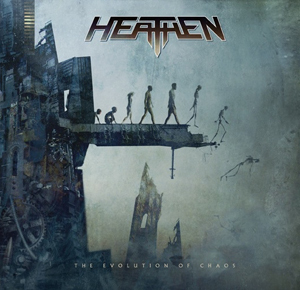 Reactivated San Francisco Bay Area thrashers HEATHEN have set "The Evolution of Chaos" as the title of their new album, due later in the year via Holland's Mascot Records. Check out the cover artwork below. Photos from the recording sessions are available in the "Pics" section of the band's MySpace page (free registration required to view pictures). Fan-filmed video footage of HEATHEN performing the new song "Arrows of Agony" on April 5, 2008 at the Keep It True X festival in Lauda-Königshofen, Germany can be viewed below (courtesy of "stoneagelightning").